This is a wonderful seaside community making up part of the Northern coast of San Diego county. It is the ideal locale for either raising a family, or just settling into for the retirement years. Resident have easy access to downtown San Diego with a approx. 30 minute drive using any of its access routes which include Interstate 5 and Highway 101. The temperature range here in Solana Beach brings no complaints with it averaging about 62 degrees during the winter months, and a very comfortable 77 degrees during the summer season. The Solana Beach School District tends to the educational requirements for the residents of Solana Beach along with the San Dieguito Union High School District. 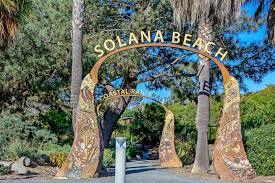 Solana Beach has a fine collection of businesses to cater to all of the amenities the residents here require. There are plenty of shops that provide a most satisfactory shopping experience. For food fare there are many fine restaurants to be enjoyed. All of the professional service needs are aptly attended to by the selection of professional businesses who offer their services here. Financial institutions such as Banks are readily accessible. Then for larger city amenities the residents can easily travel the short distance to San Diego city. There is plenty to see and do here for both residents and visitors. The fun ranges from balloon rides to electric bike rides, to fun at the beach or strolls through the many beautiful parks. Outdoor activities can range from participating in sports activities through to sitting and enjoying the serenity of the beautiful parks. A trip to Fletcher Cove provides a wonderful day’s outing, or perhaps some snorkeling at Tide Beach Park would be appealing for a day’s activity.